What do all of these Spalding Method curriculum titles have in common? They are all based on the Romalda Spalding’s method of teaching phonics and spelling. Romalda Spalding was the author of The Writing Road to Reading, and she came up with an organized way to teach a very old and basic concept: Using the phonetic sounds of the letters to teach reading. So if this was the case and this new way of teaching was so ground breaking, why did so many of us end up in the reading lab by the time we were in second or third grade? Because it didn’t work for everyone. In fact, it didn’t work very well at all. Mrs. Spalding created a method that was a very back to basics approach, and a very successful one at that. The Writing Road to Reading was written by an educator, for classroom teachers. It is thick, dry, disorganized and seems to be missing ‘something’. All of the other curriculums I listed above were written to be companion pieces to WRTR, or stand alones which utilize the Spalding Method, but apply it practically for the home setting. Since I have experience with only one of these, Teaching Reading at Home and it’s companion The W.I.S.E. Guide for Spelling , I will tell you about them. I should also note here that TRAH has been rewritten, and retitled Spell to Write and Read . My review of TRAH will also apply to SWR, because they are virtually the same book. Wanda Sanseri was a public school teacher who trained under Romalda Spalding. She began homeschooling her own children, and in a natural development of her homeschooling, she adapted what she learned from Mrs. Spalding into her own curriculum, which she used with her own children. There are 70 basic phonograms which make up the English language. Many reading or phonics programs teach most of these phonograms, but then teach many others as exceptions. Truth be told, there are so FEW exceptions in our language that it only presents confusion when we say “But this one is an exception” and give no explaination for it. Word lists abound, even for kindergarten, with ‘sight words’–words that well meaning teachers SAY cannot be spelled phonetically. An example is “the”, which is pronounced /THEE/, not /THUH/, therefore spelled phonetically! /th/ makes it’s second most common sound (the voiced /th/) and /e/ says it’s name at the end of a syllable. Many of the supposed exceptions were actually INVENTED by American’s poor ways of pronounciation! I am an American and I am guilty of the same. 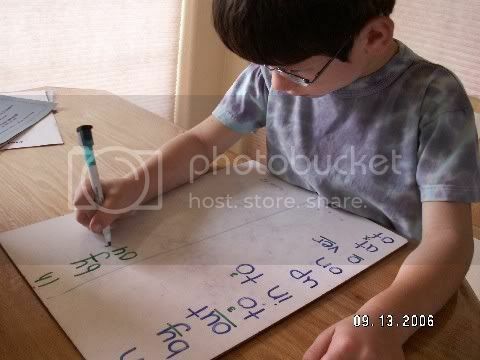 The basis of the program are the phonogram cards and the student’s spelling notebook. This curriculum is non-consumable, making it a very good investment, particularly if you are teaching multiple children over the years. The only replaceable components are a $1 composition notebook each year, and a red pencil! The parent creates their own notebook to use as a guide in helping the child create theirs. I cannot stress enough the importance of creating this notebook! If you are brand new to using Wanda Sanseri’s program, follow her directions in Teaching Reading at Home or Spell to Write and Read (whatever respective version you are using) and make your own notebook. Do this before you begin to teach it to your children. If the program seems confusing to you, or if you have had trouble in the past with all of those spelling rules and seemingly strange spellings of English words, you won’t be by the time you finish your notebook. Just the process of copying all of the spelling lists into your own notebook, marking the phonograms, and copying the charts into it will teach you pretty much everything you will need to relay to your student. This is how I learned to use it myself. Get an age/skill appropriate composition notebook for your student. This means wider lines with the dotted center line. Mrs. Sanseri’s company, Back Home Industries, sells some, although I’ve not purchased them from there so I don’t know what they are like. I used to buy some by Roaring Springs, which they sold at my local Staples office supply store. Staples no longer carries these, but I was able to locate Roaring Springs Composition Notebooks at Amazon.com. The Riggs Institute also carries some very nice ones for under $2.50 each. They also sell notebook paper with the dotted center lines though! One ream of that is about $12 if I remember correctly and when I did buy a ream (8 years ago) it literally lasted us until my big kids no longer needed the dotted lines. They used it for everything. 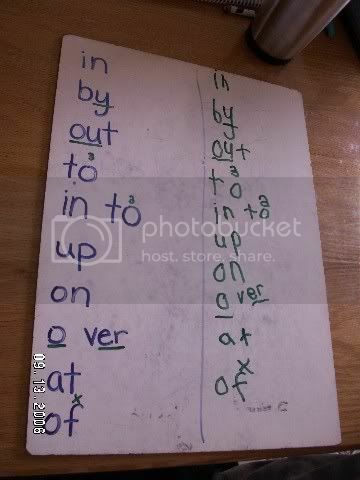 Don’t insist on your young one to do 20 spelling words a week. I started out my kindergartners with 5 words, until they were able to write more and attend longer. Then bump up to 10 words. The WISE Guide has the lists neatly divided into twenty words each, and those are divided again into tens. D1 and I (in kindergarten, and with then-undiagnosed Autism Spectrum Disorder) did ten words at a time, and I dictated a sentence to him afterward for him to write. I also would have him make up his own sentence, including some of his current or past spelling words to make it relevant. The sentence I dictated to him yesterday was: I can see the good cat. He came up with his own sentence also: My tan dog is last. Have your child read his/her words and sentences back to you. After we do his spelling words, I have him read them back to me. Then we do the two sentences, and he reads those to me also. I have a set of Christian Liberty Press Phonics Readers, and he reads me a story from Book A after we are done with our spelling lesson. These pictures show how we started out doing spelling at the beginning of first grade. I sounded the words out with him, writing them in a column on the white board, and we would go over how to mark them. Review the spelling/marking rules they know as you do this. Then, I’d just have him go back and copy each word and mark it correctly. My son has difficulty with his grip, and writing itself is a huge chore. If he’s having a really off day, then I don’t insist he do the writing but I will insist he dictate the spellings and explain the markings back to me. Children need to develop language skills (written and spoken) while learning to read. Dictate a sentence here and there, have your child retell a short story back to you (called narration by the Charlotte Mason fans), and talk about basic sentence structure- “We start a sentence with a capital letter and finish with an end mark- a period or question mark.” If it becomes a natural part of their reading and writing experience, the teaching aspect of it all will be so much easier later on. If you take the time to learn to use this program, you will be rewarded tenfold when your children are reading fluently and spelling well. Be assured that you will learn some things also, even if English was your strong point in school. Call it whatever you want- spelling, reading, language arts. It is all of the above, and it is the one skill in life that no child, no adult, can live without. Reading and language skills are the key to all other areas in life. This was a totally unsolicited review, because I love the program and have used it for years. No compensation was received. Okay, I'm sorry, but I'm a bit confused. Are you saying that the Spalding method is different from what we were taught in the 1970's? I'm attempting to use First Grade Learning At Home by Ann Ward. She mentions Writing Road to Reading and Spell to Write and Read. Suzanne: From what I remember from learning to read in the 70's, I was taught sight reading only and ended up in reading lab at my new school in 2nd grade, because I could not read! Spalding method teaches ALL the sounds of every phonogram, with only a scant few exceptions. For example: most begiining reading programs teach 'the', 'of', and 'what' as exceptions. Of the three words, the only exception with Spalding's method is 'of' because F makes the /v/ sound. for "the": /th/ is the second sound of TH, the E says /e/ because E says it's name at the end of a syllable. for "what": WH is the two-letter /wh/ sound, A makes the third sound of /a/, and of course T makes the regular sound. Does it make sense? It makes sense to my son, and he's only six. Taught in the context of learning the phonograms and the spelling words in the lists, it is amazing how easy it is. I love the method! BTW, Writing Road to Reading was written for classroom use, and Spell to Write and Read was written specifically for homeschoolers, by two different authors but using the same methods. I'm wondering whether you could elaborate on your take on the difference between the four programs. Did you try to use the WRTR before using the STWR stuff, and have you used the Riggs materials at all? What about using it for remedial work? I have an almost 10 who cannot spell. I have a tutor working with her using the Riggs program. It's been about a month. I'm not sure how long it will take to see results. She reads well, if slowly. Spelling and writing are agonizingly slow. I am wondering if I can take over her tutoring using any of the programs you discuss. I tried to use WRTR with her before getting the tutor, but it seems I was not using it correctly. WRTR is a bit hard to figure out. Suzanne, I used all three of the Learning at Home books, Pre/K, First Grade, and Second Grade. The Pre/K book had lesson plans for WRTR, basically presenting five words a day… she had other little timeline events like when to start reading, but it was very simple. It really helped me get started with WRTR. The discussion still comes up comparing WRTR to SWR. Although I've never looked closely at SWR, but from what I've read I'd use SRW if I had to do it all over again. I'm at this site because I used to have a link to a great comparison btwn WRTR and SRW which I can not find now… did it just get rewritten because this article sure sounds familiar but is not exactly the one I'm looking for! Talapas: I started out using WRTR. It was written for educators, and is NOT homeschool friendly in the least. The spelling lists seemingly go on forever, and there is no real correlation with what lists are recommended to be reached by what grade, etc. I have a friend who used WRTR with the Riggs materials for ten years, and liked them very much. I opted for WRTR with Teaching Reading at Home, which was written conversationally by a home educator, for other home educators. It really is a choice for you to make, which you would prefer. Wanda Sanseri makes the material VERY understandable and easy to use. You could easily use just WRTR for remedial work. Honestly, you could take the spelling lists, make yourself a teacher's spelling notebook, and just teach from that! I am doing something similar right now (but I use the WISE Guide for Spelling, which goes along with TRAH) with my delayed first grader. We use the Spalding method with his public-school spelling words. We sound them out phonetically, mark them, and go over them in the very same way. This is very do-able. I see it's been a while since you posted; how is your daughter doing with the tutoring? DD is doing well with the tutoring. It's been about three months now. I'd like to take over, but ow I have the dilemma of what to use with Ds 4. I'd like to use the same thing for both of them. Do you think it would be too confusing for DD if I switched her over to STWR? I hate to mess with her right now. Also, all she is doing for language arts right now is the tutoring. I've hit a wall with my HSing. Or she has. I really wish I was a good teacher, but mostly I just feel uninspired and stressed out. talapas: Sorry delaying a reply! Your youngest would be better off starting out with this from the beginning. Is your DD in school, or are you having her tutored at home and you're homeschooling her? I ask because that makes a difference in how to approach it. If you're already homeschooling her, just change over to STWR and start out with that from the beginning with your younger one too! The phonograms are the same and the word lists are the same (I'm pretty sure, haven't compared them side by side in years) just rearranged in a different order. Also if you can contact Back Home Industries http://www.bhibooks.net you can find out when & where the next training class is. They are about $50-60 and WELL WORTH IT if you feel you don't know how to teach it! I took it after teaching it for four years, and still I learned a lot too. There are company reps in every state (sometimes more than one per state) and they set up trainings. If one isn't set up, it's not too hard to get one going. Hi Dawn: I know a little bit about Riggs program, only because a friend of mine used it for years. I started using Teaching Reading at Home (precursor to Spell to Write and Read) a few years after she started Riggs. The programs are similar except that Riggs was written for classroom teachers, and SWR was written specifically for a homeschool setting, making it easier to implement. Hello – I’m curious, what Math curriculum did you do alongside SWR? I will be homeschooling my son starting in Kindergarten. Thanks! Michelle, we always used and enjoyed Math U See for our kids in K-2nd grades, or even higher if they enjoy the format and do well with a single topic for the year. MUS is very hands-on, interesting, and teaches them WHY math works not just how to work out problems. Don’t stress about Kindergarten!! Enjoy it. Take time. Play and read a lot. Also, I wrote a post for newbies called Dear New Homeschooler. Enjoy it because Kindergarten is fun! Hi Michelle: We always used SWR and Math U See for K-2nd. MUS is hands-on, with short lessons that keep them engaged and they can SEE how math works. That’s a huge plus for a young one! Thank you, thank you, THANK YOU for this post! I learned to read & write with Spalding in school & want to use it in our homeschool, but I have had a hard time finding examples on how to teach it at home. I definitely emailed this to myself. Thank you again!! Thank you so much! I am a homeschooler and was looking at curriculum for Kindergarten for in the fall. My sister gave me the Spalding phonogram cards that her kids used in school and I had heard of SWR from some other homeschoolers. I had no idea that they were connected till now. I have a four year old (she will turn 5 in a couple of months) that has learned some of the phonograms. She has just started a little handwriting. when would you suggest starting SWR?